Has the double offset shaft and two ball design that Odyssey has been so popular for ever since it came out. The bronze finish is just for appearance, to give the putter a premium look. The grip is slightly contoured and has a very nice tacky sensation. It will also perform well in hot or wet conditions. This is a forgiving putter with lots of great characteristics. Lots of beginners and middle handicap golfers like the two ball design for alignment purposes. 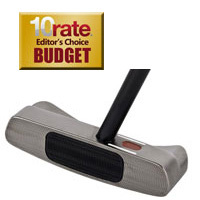 It’s a compelling choice and replaces the classic mallet head design Odyssey two ball putter. It sells for around $179.